I had so many questions about white oak hardwood flooring. Simple questions, about what hardwood flooring costs per square foot and how to stain hardwood flooring inside the house. I’m sharing my research as well options that we considered today. Plus, hear exactly how the hardwood flooring install happened in our house and what we think of our white oak hardwoods. 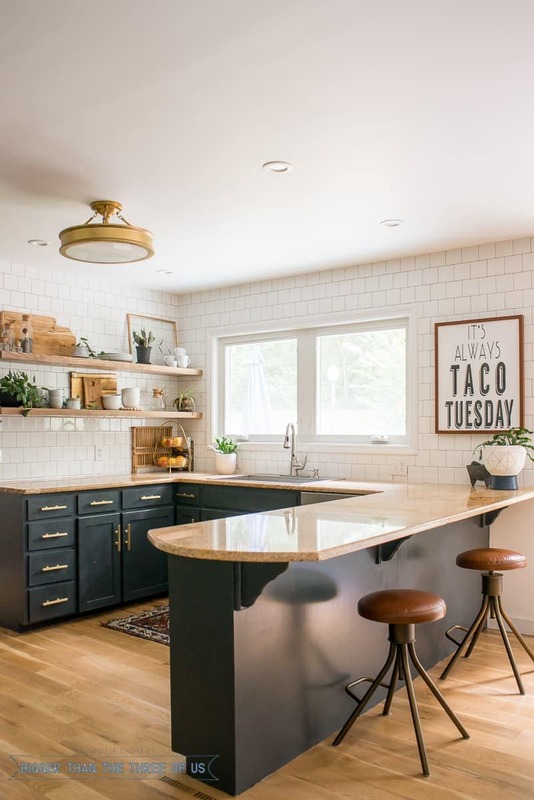 Before I share exactly what I picked and why, let me tell you a bit about how I ended up going with the white oak flooring that we went with. So, I got my samples from Vermillion, checked out other local flooring businesses and ordered samples from BuildDirect. It all seemed overwhelming. Money was tight on being able to do the main rooms that we wanted to do (1500 sq feet) and having it installed. So, we decided to wait. We DIY lots of things around here, but the flooring is just too much for us to tackle. 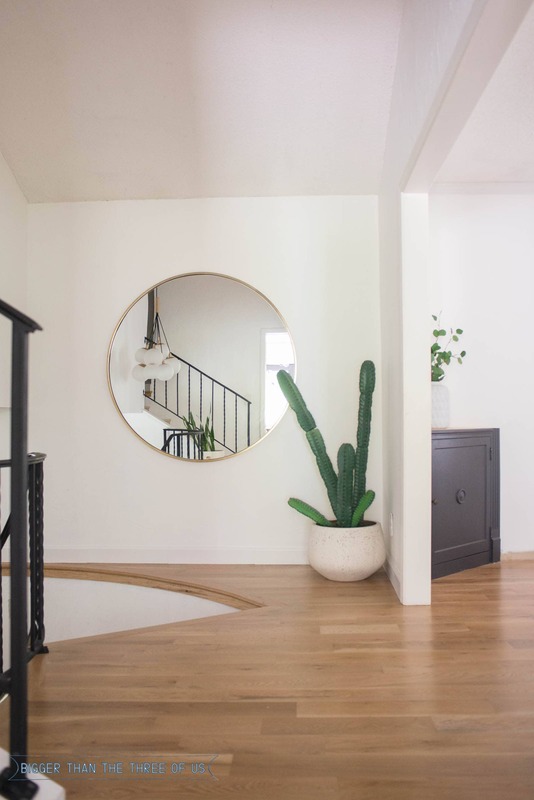 We have a custom circular staircase in our entryway, which we knew would be a huge undertaking to create custom stair treads for, as well as two different circular trim pieces. So, this wasn’t going to be a DIY project for us. As usual though, I have found ways to save on it and will share those at the end! So, fast forward a bit and we were finally ready to pull the trigger and just get ‘er done. 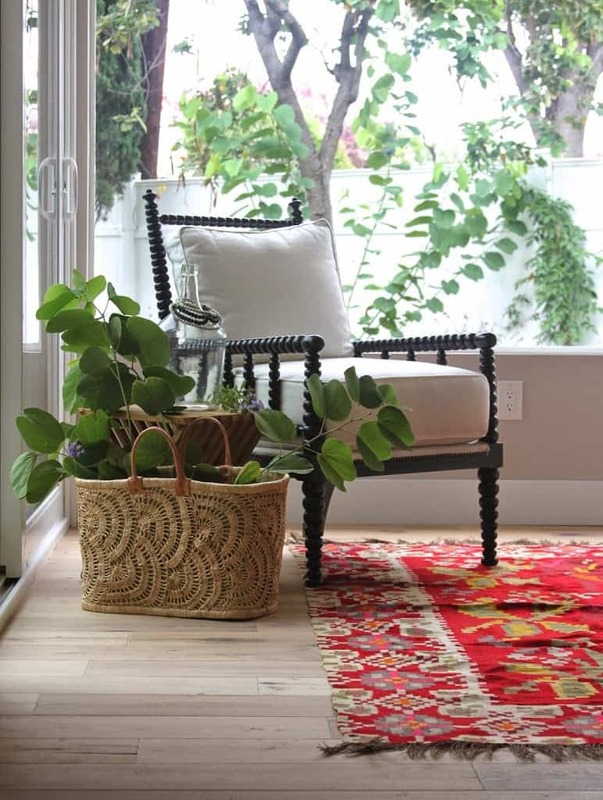 My Pinterest Living Room board is filled with amazing flooring, but these four really stick out: 1, 2, 3, 4. If we went with pre-finished flooring (either engineered or hardwood) then we could have the installers do room by room. This would mean that we could move everything out of one room to the room next to it each day. This is much easier than having them install unfinished flooring. With unfinished flooring, you have to move everything out of the rooms that are having the flooring put in, all at the same time. This is because they have to do multiple coats of stain and poly and they are doing those all at the same time. Moving everything out (1500 sq feet) and up/down multiple sets of flooring seemed crazy. So, I was determined to find finished flooring (meaning, it could just be installed and then it would be good to go). It ended up being a pretty lively discussion, which totally helped me! I LOVED the left sample but it’s engineered hardwood. There’s lots of discussion on engineered and what a great product it is. Lots of people chimed in saying they loved theirs and others chimed in saying to only go with hardwood because it can always be refinished. I think, in our neighborhood, it would be considered a negative to go with the engineered. I think it could be viewed as a cheaper product. Not that it is a cheaper product, but, where we live, I think people would expect hardwoods. Our area tends to favor simple and traditional. Now, this is our forever house (or our house until we sell everything and become life travelers – when Greyson leaves for college). So, we aren’t thinking re-sell value anytime soon. But, it is in the back of my mind. The right one is a natural oak hardwood (European Oak). This one was Luke’s favorite. I like it, and actually like it quite well in the online pictures, but it pulls a bit peachy in person. Would the whole floor look peachy? I’m not sure. So, I went back and forth over these samples. Both were pre-finished and both were from Build Direct. One was engineered hardwood and one was regular hardwood. I wanted the color of the left but the quality of the right. I just couldn’t decide because neither was perfect. When I’m spending over $10,000, or even over $200… I want things to be perfect. After reading through all the comments on IG and Facebook and talking to our installer, I went back to our local mill. It was the one. Seriously, the color is a bit off in that picture, but I loved it. 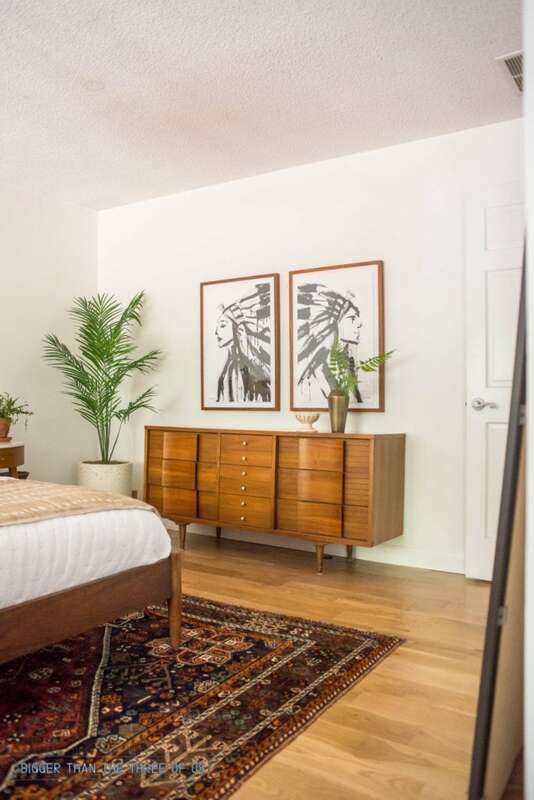 Well, I loved it until I found out how much it was – $9.75 a sq ft (that’s just the price of the wood flooring per square foot not including the install). What?! No!! For comparison, we were considering finished flooring up to about $5.50 a sq ft. So, this was completely out of our budget. 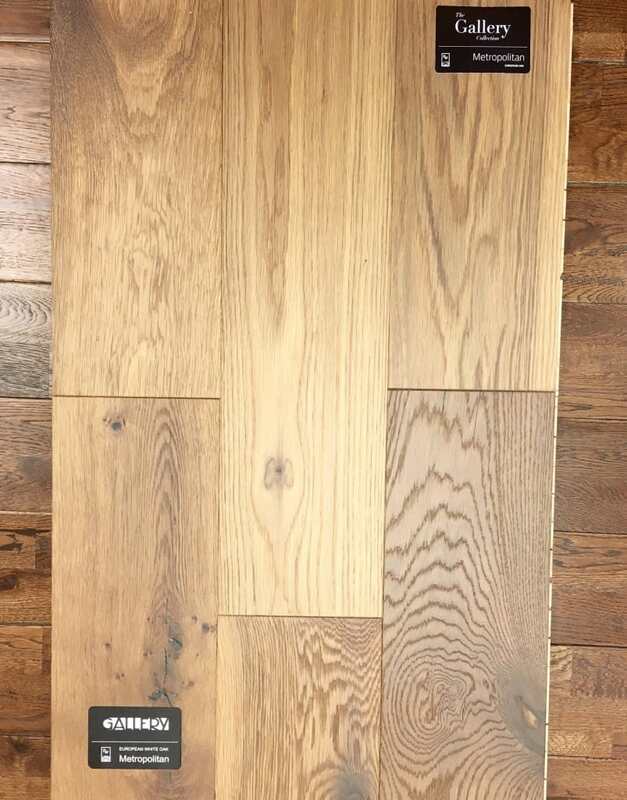 I loved that Metropolitan European White Oak Flooring and after quite a bit of talking, we decided that we could get a similar look with the unfinished white oak wood floors from our local mill at a much lower cost. We went back to the factory to determine if we wanted “select”, “1”, or “2” wood. Basically, the wood is graded from no variance in colors or knots to lots of variance (in colors and knots). Select : Highest Grade with little to no variance in colors and knots. 1 : Minimal knot sizing and variance color. 2 : Larger knots and a range of colors in the wood. They weren’t running white oak when we were there so this is red oak. On the left, you can see that there is almost no variance in colors (that’s a 1, common) and the right side shows variance (2, common). I thought I’d want the 1, common but when I saw a few pieces laid out, I realized that it was too perfect. All my inspiration pieces showed variances. So, I went with 2, common in 5″ planks. How Much Does White Oak Wood Flooring Cost? As a general rule of thumb, the larger the plank size, the higher the cost. 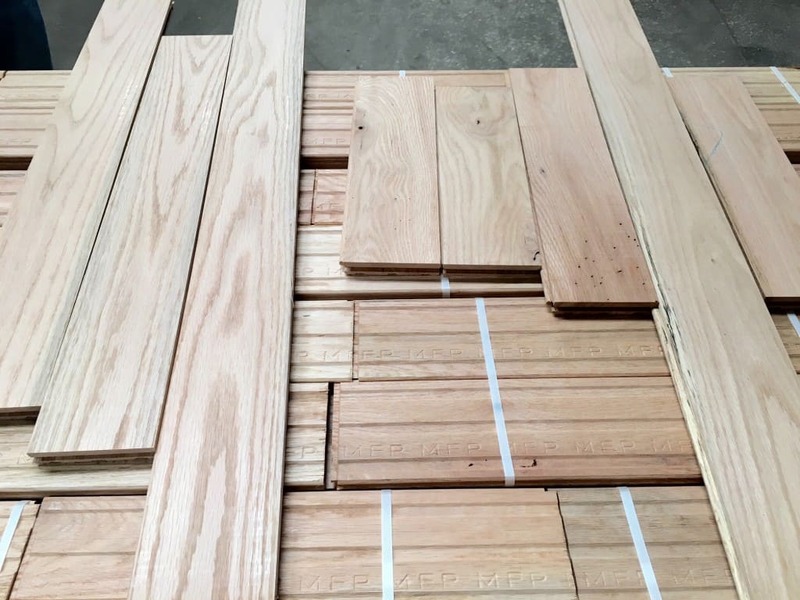 For the 5″ unfinished white oak floors in the 2 common grade level, we’re talking about $2.55 a square foot. As you can tell from the prices that I shared earlier, prices for wood flooring have a huge range. For unfinished white oak flooring, you can expect to pay $1.75-3.50 per square foot. For finished white oak flooring, you can expect $5.00-$12.00 per square foot. $1.75-$2 square foot for the install alone and then $2.00 per square foot for the staining and finishing. Our quote was $4 square foot to lay the wood and finish it. That doesn’t include ripping up baseboards or old flooring. **You can save yourself money by ripping up baseboards and old carpet yourself! Luke and I did it ourselves and it wasn’t that bad. A huge plus side for getting unfinished is that I was able to order flush-mount wood registers (for the floor vents) that are going to be a perfect match as well as all the trim work around our circle stairs. Another plus to going with unfinished wood flooring is that the curved wood stairs install is easier to match because you can use the same stain. For our curved wood stairs (including the custom moulding, planks and finishing) the cost was $3,000. There’s a level of craftsmanship needed to work on custom pieces, so I can’t say I was surprised by the price. I debated about installing herringbone wood floors in our library. The cost was about $560, which equals out to be about 30% more on your install price. 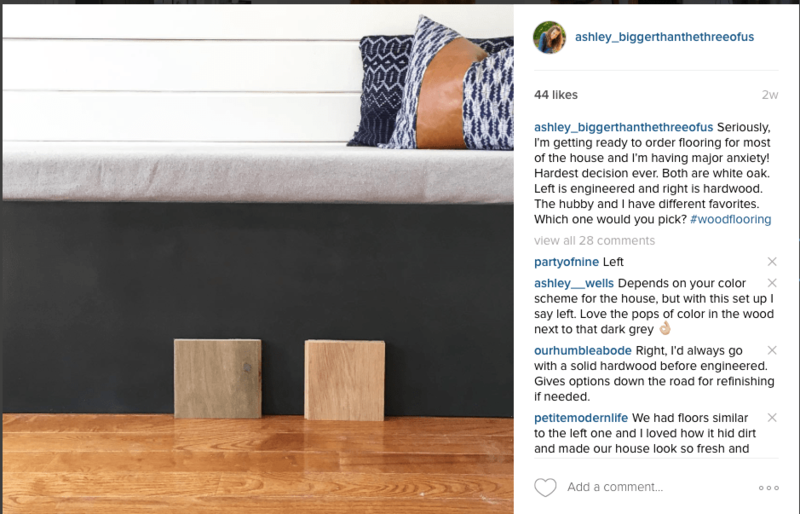 I realized that I loved the look of herringbone when the wood flooring planks were 3″ but I didn’t love it with the 5″ wood planks. Since I was going with the 5″ wood planks, I decided to forgo the herringbone pattern. I’ll answer a few more questions about the floors in just a second, but let me show you how they turned out! I love them! I debated back and forth about the stain for the white oak floors and am happy to say that I love what I picked. Stain changes the look of the flooring drastically! I originally thought that I didn’t want the warmth of the stain but didn’t like the color of the wood with just the poly over the top. My installer tested out a few swatches in the bedroom and let me think about it for a while. I eventually decided on Weathered Oak stain by Minwax finished with an eggshell topcoat. Its the perfect honey-warm color that I just adore. I wasn’t very far along with my kitchen renovation when I had the flooring installed. 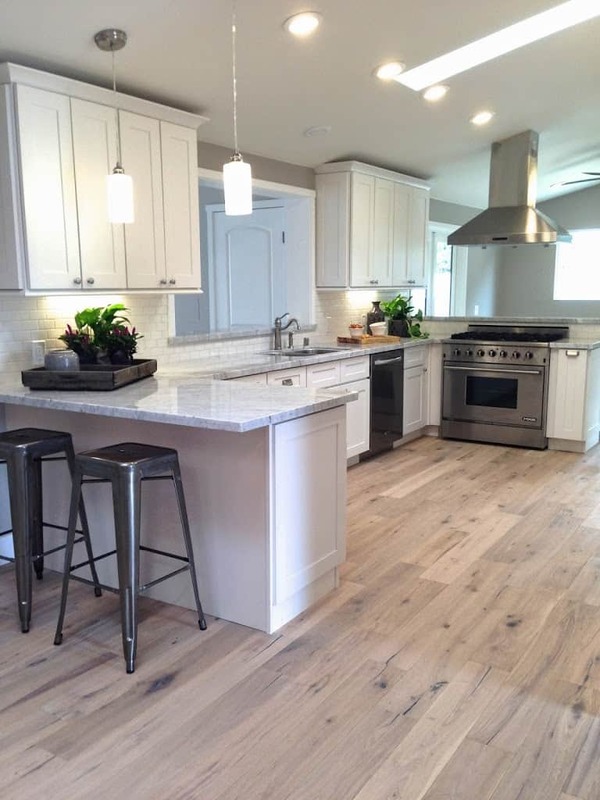 I’m happy to report that the white oak hardwood flooring with dark kitchen cabinets look good. I love the combo. All in, the flooring cost about $10K but a big portion of that went to our curved staircase. I hope I answered most of the questions that you’d have about the flooring, but if you have something that I didn’t answer… just leave it below.